Glass ranks as one of the most important materials of our age. You have only to think about smartphones, or drinking glasses, or look out of the window to realise that glass in its various forms is omnipresent. Fibre-optic cables transport our emails and research work out into the world, and buildings without architectural window glass are hardly conceivable nowadays. Glass plays an important role in everyday life without us being aware of its complex structure. The most common types of glass are based on silicon dioxide. Its structure is taken as the prototype for amorphous networks. The term glass is used synonymously for amorphous materials here. The material properties can be modified by adding different additives to glass. But although researchers have been investigating glass for many decades, we have only a vague idea of its atomic structure. This information in particular is crucial for the characterisation and understanding of materials, however. Clarifying the atomic structure of glass is one of the most important, yet unsolved issues in science. Figure 1(a) illustrates how similar crystalline and amorphous samples can be. It shows a crystalline silicate − also called quartz − together with an amorphous silicate, i.e. a glass. Most of the physical properties of these two samples are surprisingly very similar. It is not possible to distinguish the two states from each other just by looking at them. Both samples are optically transparent. But what is the difference between these two phases? Comparative investigations of crystalline and amorphous silicon dioxide samples were undertaken around a hundred years ago, almost as soon as the Laue method for the diffraction of X-ray or neutron beams on solid bodies had been developed. These methods average over large sample volumes on the macroscopic scale and primarily provide information in reciprocal space. Crystalline samples produce discrete diffraction patterns which glasses do not. The diffraction information obtained from glasses can be compared with theoretical models of the atomic arrangement, but do not allow an unequivocal structural assignment. It was in this context that W.H. Zachariasen postulated the so-called "Random Network Theory" eighty years ago to explain the structure of amorphous materials . With silicon dioxide, the simplest structural unit in the three-dimensional case is a SiO4 tetrahedron. If the complexity of the system is reduced from three to two dimensions (2D), the simplest structural unit for silicon dioxide changes from the SiO4 tetrahedron to a SiO3 triangle. In Figure 1(b) these SiO3 triangles are linked to each other as individual building blocks at fixed 180° angles, corresponding to a crystalline material. This creates long-range order and periodicity. If the angle between these structural units is varied, the building blocks can develop an extended network with rings of different sizes. As can be seen in Figure 1(c), the uniform structural units are linked to each other at apparently random angles. This produces structures which − apart from the structural units − have no long-range order and no periodicity. Zachariasen fell back on this simplification eighty years ago and thus created a model to explain the atomic structure in amorphous materials which is compatible with the existing data from X-ray and neutron diffraction. He drew a 2D diagram in which trigonal units are linked together to create the amorphous network. But can a similar reduction of the three-dimensional structure to a 2D model system also be realised experimentally? The "Chemical Physics" Department of the Fritz Haber Institute specialises in developing systems which make it possible to depict the complexity of dispersive real catalysts and investigate them in the form of models. This involves producing thin, well-ordered oxide films on metal single-crystal substrates which can also be used under the experimental conditions of surface physics. 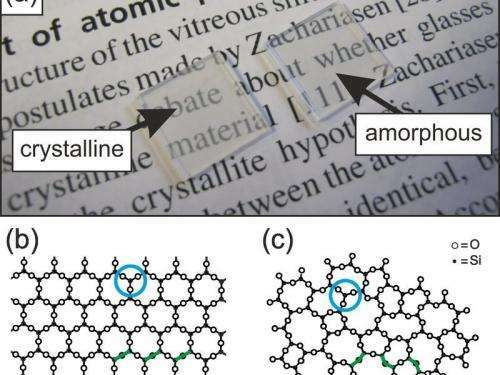 In this context, thin silicate films had already been specifically prepared back in 2000  in order to be able to study catalytic surface reactions. The first studies investigated silicate films on molybdenum single crystals . More recent studies also opted for other metal substrates [3−5], including ruthenium [3,5]. By using different metal single-crystal substrates it is possible to exert a crucial influence on the growth of these thin silicate films. 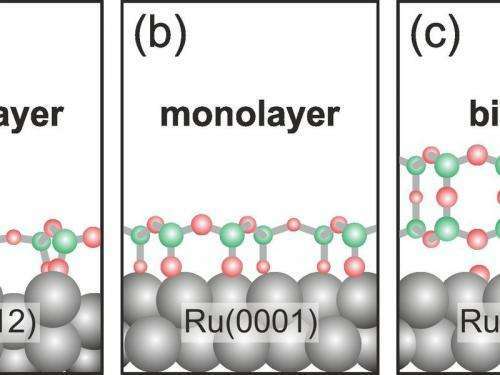 While the molybdenum single crystals form predominantly crystalline films of monolayer thickness, with ruthenium single crystals it is possible to specifically produce monolayers as well as bilayer silicate films. Figure 2 shows a side view of models for these film systems. Surprisingly, the bilayer silicate film on ruthenium single crystals can be produced in crystalline  as well as amorphous modification . This is evident from measurements with low-energy electron diffraction (LEED). But can this film system also be used to observe the atomic structure directly and thus make the postulate of amorphous materials visible? Let us look at the possibilities of modern scanning probe microscopy compared to conventional diffraction methods. The clear advantage of the new microscopy technologies is the local imaging of surfaces with atomic resolution in real space. The potential for various types of glass was already indicated by the first measurements made by the research group of Klaus Wandelt and colleagues [6−7]. No-one has yet been able to carry out the atomic imaging and clarify the structure of amorphous materials with this method, however. One reason is because imaging strongly corrugated surfaces with scanning probe microscopes is difficult in general, because slightly lower atomic positions on the top layer are concealed by neighbouring atoms. Another reason is that, in scanning tunnelling microscopy (STM) in particular, the electronic information and the topographic information on the atomic level are closely entangled with each other and often difficult to disentangle by spectroscopic means. 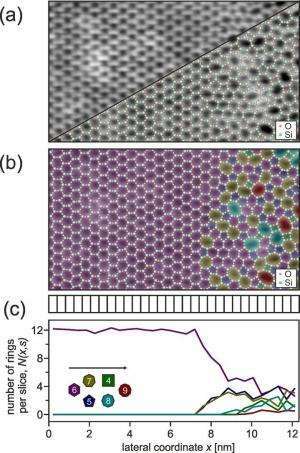 Since glasses are usually good insulators, their lack of conductivity makes it more difficult to investigate them with scanning tunnelling microscopy. All these problems can be solved for the bilayer silicate film on ruthenium single crystals which has been developed at the Fritz Haber Institute [4,6]. On the atomic level, these films are flat and are ideal for using scanning tunnelling and atomic force microscopy (AFM). Figure 3(a) shows the image of this bilayer silicate film obtained with the scanning tunnelling microscope. Depending on the configuration of the probe tip, it is possible to resolve either oxygen or silicon positions of the silicate film . In the top layer, three oxygen atoms are arranged about one Si centre. Peaks with atomic separations and symmetries can be clearly seen in the detail shown here, and they allow unequivocal assignment of the silicon positions. This contrast makes it possible to compute the positions of the oxygen atoms. A reversed assignment can also be carried out for measurements with an image contrast for oxygen positions. The atomic positions determined in this way are drawn in Fig. 3(a) on half the image. It is thus possible to obtain a complete set of coordinates for the atomic structure of this amorphous silicon dioxide film. The direct comparison of Zachariasen's model from Figure 1(c) and our experimental measurements with atomic resolution in Figure 3(a) are a clear proof for the proposed structural elements in amorphous networks. The clear and unequivocal determination of the atomic positions makes it possible to undertake a comprehensive evaluation of the existing structural elements. The pair separations of the network can be computed from the coordinates and compared with those derived from the pair correlation function obtained from X-ray diffraction. This is shown in Fig. 3(b). The pair correlation function of an amorphous system contains broad maxima, which become even broader as the radial separation increases, instead of the discrete lines of crystalline systems. This broadening mirrors the amorphous character of the structure. Since the atomic positions are known, it is also possible to chemically assign the individual maxima of the pair correlation function. The agreement between the pair correlation function from 2D positions and the pair correlation function from the X-ray diffraction of 3D materials shows that the flat silicon dioxide film is a representative model system for a three-dimensional amorphous material. It therefore plays a key role in determining the structure of glasses. What is particularly interesting about the data obtained here is the direct determination of bonding angles, atomic separations and ring sizes. The number of Si atoms per ring typically varies between four and nine ring members. 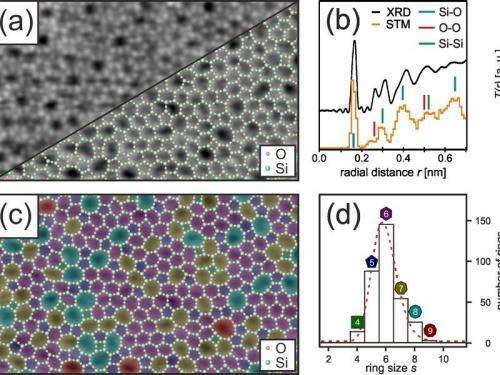 The most frequently occurring ring consists of six Si atoms and corresponds to the structural unit of a highly ordered, crystalline silicon dioxide film. In Figure 3(c) the ring sizes determined have different colours. It is possible to say something about the frequency distribution of the ring sizes which occur (Fig. 3(d)) and observe the way they link up with each other. Transitions between crystalline and amorphous regions can also be imaged and characterised , as shown in Figure 4. The image of this boundary layer makes a direct contribution to understanding the glass transition at the atomic level. It has not yet been possible to clarify the structure of amorphous materials in this dimension. Here, we wish to point out that after our initial work was published, a further research group has been able to reproduce this 2D silicon dioxide network on graphene, image it with the aid of transmission electron microscopy (TEM) and also show structural rearrangements under the influence of the scanning electron beam in its more recent work . We are the first to clarify the structure of amorphous materials on a 2D model system using scanning probe microscopy technology. We have succeeded in imaging a silicon dioxide network with atomic resolution. These measurements unequivocally confirm theoretical considerations on the networking of glass structures which were postulated eighty years ago by Zachariasen. It can be assumed that the successful preparation of this amorphous silicate film on different substrates will also provide many new stimuli in a variety of fields of application for this new class of materials in the future.